It’s the most wonderful time of the year, or so the song goes, which means that the Dreamsofego studio is closing down for the festive period. I’ll be back in the new year though, so please feel free to send any commission requests to the usual address and I will get back to you as soon as possible in 2015. Before I go however, here is a cute little foursome in celebration of 2000AD bringing back some of the favourite characters from my youth in their 100 page mega-special. Merry Chrissstmasss to all and to all a good night! Hi Michael, I am a friend of your mum – we sing in the Addenbrooke’s Hospital Choir together. Please can I get a print of your fabulous four judges? 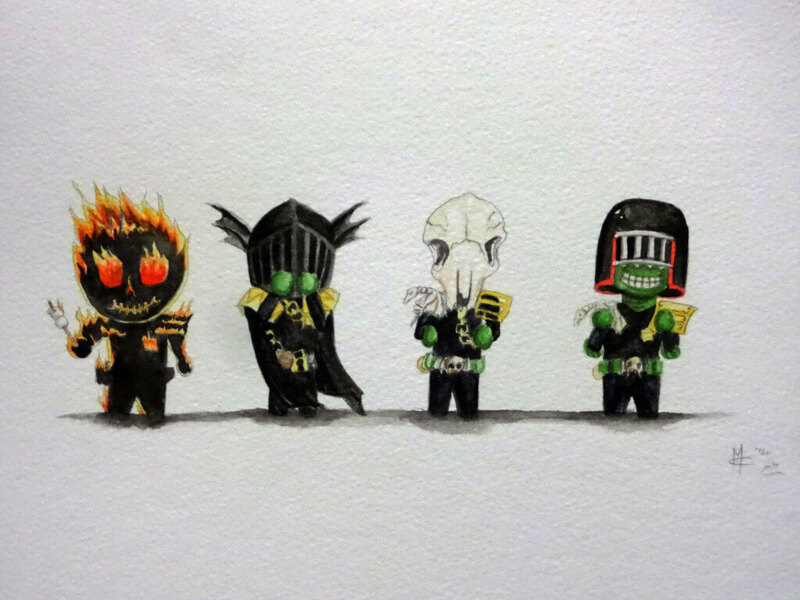 – my hubby is a HUUUUUUGE 2000AD and Judge Dredd fan and I wanna get your picture framed up for him as a pressie – can you let me know how much? and how to pay you?! p.s. I absolutely bloody LOVE your artwork!! However, as the Dark Judges piece is not one of the ones currently available there, I will email you directly.